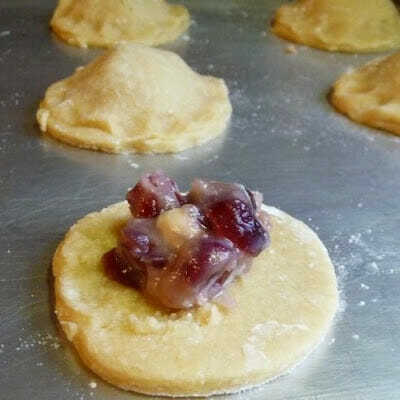 White Chocolate Cranberry Filled Soft Cookies is my Nanny’s Date Filled Cookie Recipe revised with white chocolate and cranberries to create a flavor profile that is one that Grumpy likes. A tender soft cookie with that delicious filling then topped with a pink frosting makes this a festive cookie for the holidays! It’s the time of year when I start to think about my Nanny Mae’s filled cookies. It seems I remember Christmas as the time of year I always loved to eat them. She would fill her cookies with a date or raisin filling (both of which I totally love!). I made them last year and used a mixture of raisins and dates. That is when I found out Grumpy didn’t care for date or raisin filled cookies. However, I know that Grumpy loves white chocolate and dried cranberries (his ultimate trail mix from Wal-mart is one that includes both!). So, I thought why not make a filling that uses craisins, almond extract, coconut, and white chocolate? Surely he will be crazy about these, right? Mix applesauce, craisins, brown sugar, water in medium sized saucepan and cook until thickened. Remove from heat and add butter, coconut and almond extract. Cool. When cool, stir in white chocolate chips. Assemble cookies: Roll cookie dough, cut into circles. Place circles on cookie sheet. Place 1 tablespoon of filling on top of cookie. Cover with another cut cookie and press edges with fingers (or fork). Bake at 350 until slightly brown (8 – 10 minutes). Honey, I LOVE YOU!!!! My absolute favorite thing to pair with craisins is white chocolate! I will have to make these cookies ASAP!!! They look so delicious! I love these! Recipes from family are the best. 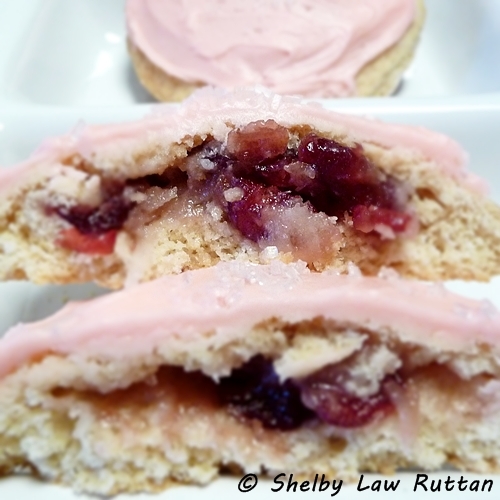 White chocolate and cranberry are so delicious together, and that pink icing is so sweet!! Okay, now I’m laughing at myself! The Oh Nuts website says they are Ocean Spray craisins. I’m a little out of it today! These look great & lucky you having such a fabulous goodie box! Love the icing and the new filling is fabulous! Those are way too cute! 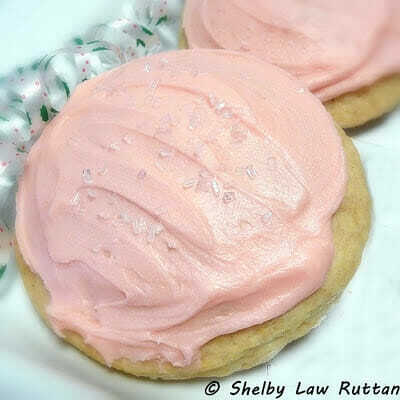 Love the pink frosting! YUM YUM YUM! Those look unique and very delicious! I love cranberries and white chocolate too. Oh!Nuts Rock! So do these cookies, they look really delicious! Love the flavors! OMG these look amazing. What a treat on the inside these would be….this is a winner. You are so sweet to switch up your traditional fillings! These look delicious – I love the holiday season and all the cookies it brings! Now I am kicking myself for not picking up something sweet at the store! These look incredible. I really love different kinds of cookies and that sure looks like a delicious one! Wow, HoneyB! I’ve never seen filled cookies like this, I don’t think. They look divine! Will have to try them! Those look so pretty! I’ve got to try these soon! Love the filling! So so pretty in pink! That’s an amzing filling! The cookies look delicious! And the filling sounds fantastic! These looks so cute and delicious. If Grumpy didn’t like them you can send them my way – I’ll gobble them up. I’m thinking these might be great on my dessert bar for Thanksgiving. They look fabulous! What so cute and amazing filling! Good and tasty cookies, can I’ve a dozen? Oh MY! These look FABULOUS!!! I would be happy with ANY version. Terrific photos,too. I wish I could sample a nibble through the screen. Such a sweet and tasty idea, the pink frosting on top is the perfect touch. I bet those ingredients tasted perfect with the tart cranberries :). Wow, so many good cookies!!! These ones might be even better than the last, the filling looks delcious! Great pictures. My boyfriends mother used to make these…and I love them, but filling them with crasins and white chocolate is pure genius…and they must be even better than the old fashioned ones. Oh boy, I'm seeing lots of cranberry and chocolate combinations lately. This one looks really good. I will be trying this one. I'll pin it to remember it! I love cranberry and chocolate together! Holy cats, those look amazing. I must. make. these! What gorgeous cookies, Shelby! I've never seen quite like these and I can't wait to give the recipe a try for myself. So excited to make these today! Is there a recipe for the frosting? I usually just melt about a tablespoon of butter, mix into it about a cup of powdered sugar, 1/2 teaspoon vanilla, and some milk. Add another cup of sugar and milk as needed to get the frosting to the spreading consistency you want. I tinted mine a little pink. Hope the recipe turns out well for you!